The following samples provide detailed information on how to build applications using BrightstarDB. If there are classes of applications for which you would like to see other tutorials please let us know. The TweetBox sample is a simple console application that shows the speed in which BrightstarDB can load content. The aim is not to create a Twitter style application, but to show how objects with various relationships to one another are loading quickly, in a structure that will be familiar to developers. The model consists of 3 simple interfaces: IUser, ITweet and IHashTag. The relationships between the interfaces mimic the structure on Twitter, in that Users have a many to many relationship with other Users (or followers), and have a one to many relationship with Tweets. The tweets have a many to many relationship with Hashtags, as a Tweet can have zero or more Hashtags, and a Hashtag may appear in more than one Tweet. For more information about connection strings, please read the “Connection Strings” topic. The following code snippets show the creation of relationships between entities by simply setting properties. In order to show the speed at which objects can be created, persisted and index in BrightstarDB, the console application creates 100 users, each with 500 tweets. Each of those tweets has 2 hashtags (chosen from a set of 10,000 hash tags). 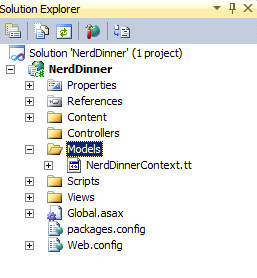 To demonstrate the ease of using BrightstarDB with ASP.NET MVC, we will use the well-known “Nerd Dinner” tutorial used by .NET Developers when they first learn MVC. 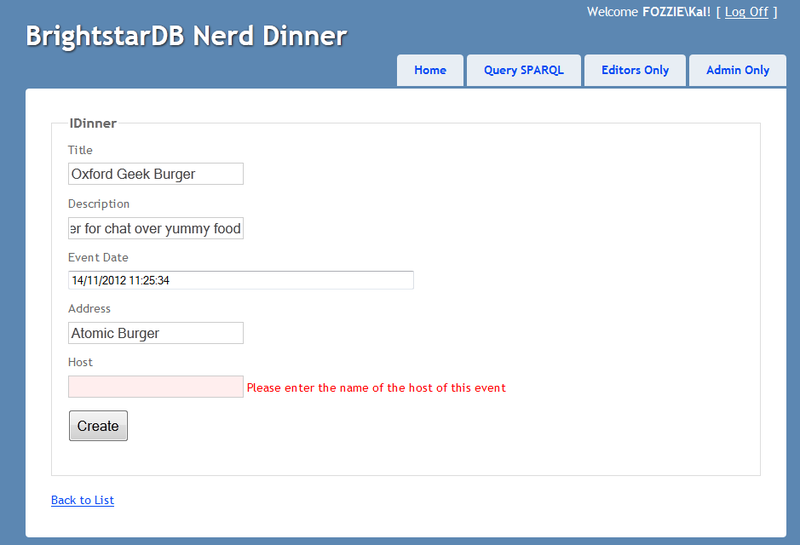 We won’t recreate the full Nerd Dinner application, but just a portion of it, to show how to use BrightstarDB for code-first data persistence, and show how it not only matches the ease of creating applications from scratch, but surpasses Entity Framework by introducing pain free model changes (more on that later). The Brightstar.NerdDinner sample application shows a simple model layer, using ASP.NET MVC4 for the CRUD application and BrightstarDB for data storage. In later sections we will extend this basic functionality with support for linked data in the form of both OData and SPARQL query support and we will show how to use BrightstarDB as the basis for a .NET custom membership and role provider. This tutorial is quite long, but is broken up into a number of separate sections each of which you can follow along with in code, or you can refer to the complete sample application which can be found in [INSTALLDIR]\Samples\NerdDinner. Creating MVC Controllers and Views - shows how easy it is to use this model with ASP.NET MVC4 to create web interfaces for create, update and delete (CRUD) operations. Applying Model Changes - shows how BrightstarDB handles changes to the code-first data model without data loss. Adding A Custom Membership Provider - describes how to build a ASP.NET custom membership provider that uses BrightstarDB to manage user account information. Consuming OData In PowerPivot - shows one way in which the OData endpoint can be used - enabling data to be retrieved into Excel. 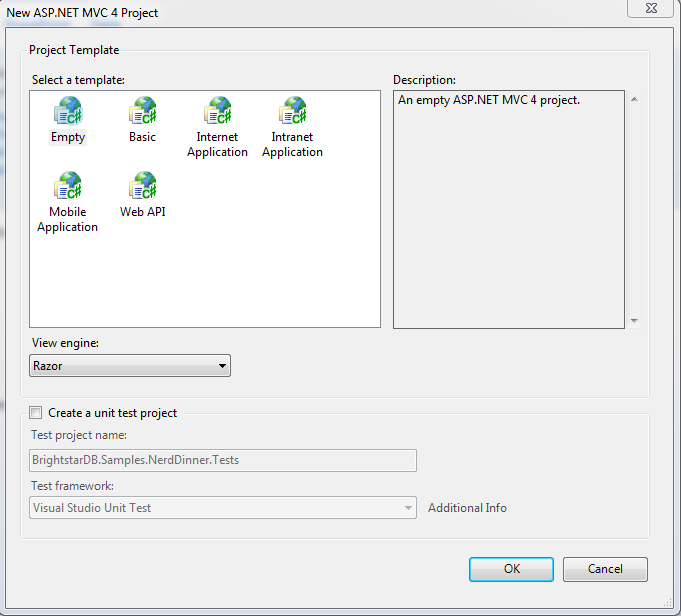 Choose “ASP.NET MVC 4 Web Application” from the list of project types in Visual Studio. If you do not already have MVC 4 installed you can download it from http://www.asp.net/mvc/mvc4. You must also install the “Visual Web Developer” feature in Visual Studio to be able to open and work with MVC projects. Choose a name for your application (we are using BrightstarDB.Samples.NerdDinner), and then click OK. In the next dialog box, select “Empty” for the template type, this mean that the project will not be pre-filled with any default controllers, models or views so we can show every step in building the application. Choose “Razor” as the View Engine. Leave the “Create a unit test project” box unchecked, as for the purposes of this example project it is not needed. The NuGet package will have installed a text template file named MyEntityContext.tt. Rename it to NerdDinnerContext.tt. BrightstarDB data models are defined by a number of standard .NET interfaces with certain attributes set. 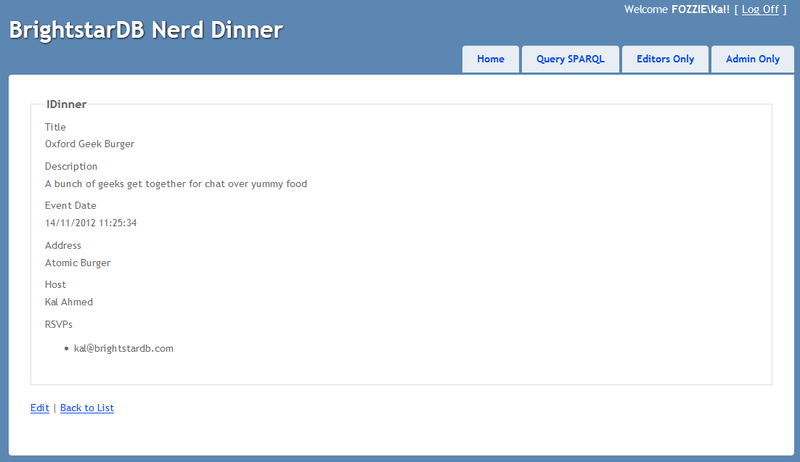 The NerdDinner model is very simple (especially for this tutorial) and only consists of a set of “Dinners” that refer to specific events that people can attend, and also a set of “RSVP”s that are used to track a person’s interest in attending a dinner. We create the two interfaces as shown below in the Models folder of our project. By default, BrightstarDB identifier properties are automatically generated URIs that are automatically. In order to work with simpler values for our entity Ids we decorate the Id property with an identifier attribute. This adds a prefix for BrightstarDB to use when generating and querying the entity identifiers and ensures that the actual value we get in the Id property is just the part of the URI that follows the prefix, which will be a simple GUID string. 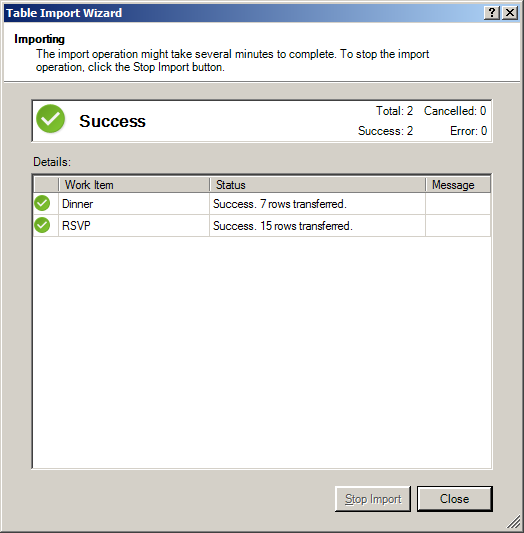 In the IRSVP interface, we add an InverseProperty attribute to the Dinner property, and set it to the name of the .NET property on the referencing type (“RSVPs”). This shows that these two properties reflect different sides of the same association. In this case the association is a one-to-many relationship (one dinner can have many RSVPs), but BrightstarDB also supports many-to-many and many-to-one relationships using the same mechanism. We can also add other attributes such as those from the System.ComponentModel.DataAnnotations namespace to provide additional hints for the MVC framework such as marking a property as required, providing an alternative display name for forms or specifying the way in which a property should be rendered. These additional attributes are automatically added to the classes generated by the BrightstarDB Entity Framework. For more information about BrightstarDB Entity Framework attributes and passing through additional attributes, please refer to the Annotations section of the Entity Framework documentation. Right click on the Brightstar Entity Context and select Run Custom Tool. This runs the text templating tool that updates the .cs file contained within the .tt file with the most up to date persistence code needed for your interfaces. Any time you modify the interfaces that define your data model, you should re-run the text template to regenerate the context code. We now have the basic data model for our application completed and have generated the code for creating persistent entities that match our data model and storing them in BrightstarDB. In the next section we will see how to use this data model and context in creating screens in our MVC application. In the previous section we created the skeleton MVC application and added to it a BrightstarDB data model for dinners and RSVPs. In this section we will start to flesh out the MVC application with some screens for data entry and display. Right click on the controller folder and select “Add > Controller”. Name it “HomeController” and select “Controller with empty Read/Write Actions”. This adds a Controller class to the folder, with empty actions for Index(), Details(), Create(), Edit() and Delete(). This will be the main controller for all our CRUD operations. The basic MVC4 template for these operations makes a couple of assumptions that we need to correct. Firstly, the id parameter passed in to various operations is assumed to be an int; however our BrightstarDB entities use a string value for their Id, so we must change the int id parameters to string id on the Details, Edit and Delete actions. Secondly, by default the HttpPost actions for the Create and Edit actions accept FormCollection parameters, but because we have a data model available it is easier to work with the entity class, so we will change these methods to accept our data model’s classes as parameters rather than FormCollection and let the MVC framework handle the data binding for us - for the Delete action it does not really matter as we are not concerned with the value posted back by that action in this sample application. This ensures that any action invoked on the controller can access the BrightstarDB entity framework context. This view shows all the details of a particular dinner, so we use LINQ again to query the store for a dinner with a particular Id. Note that we have changed the type of the id parameter from int to string. The LINQ query here uses FirstOrDefault() which means that if there is no dinner with the specified ID, we will get a null value returned by the query. If that is the case, we return the user to a “404” view to display a “Not found” message in the browser, otherwise we return the default Details view. This will also install the jQuery and jQuery.Validation packages that are dependencies. Before creating specific views, we can create a common look and feel for these views by creating a _ViewStart.cshtml and a shared _Layout.cshtml. This approach also makes the Razor for the individual views simpler and easier to manage. Please refer to the sample solution for the content of these files and the 404 view that is displayed when a URL specifies an ID that cannot be resolved. 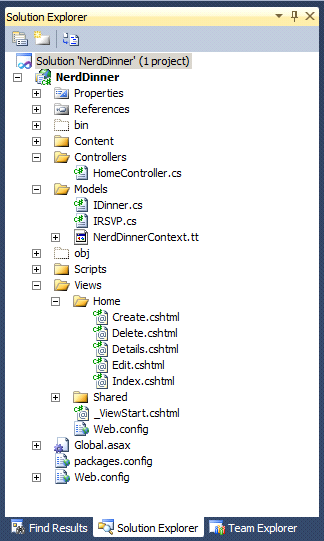 All of the views for the Home controller need to go in the Home folder under the Views folder - if it does not exist yet, create the Home folder within the Views folder of the MVC solution. Then, to Add a view, right click on the “Home” folder within “Views” and select “Add > View”. 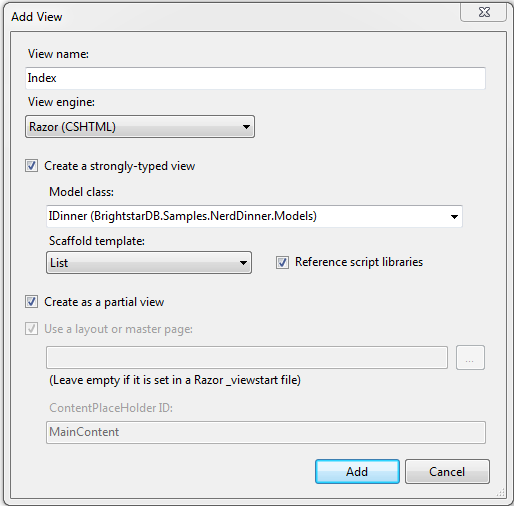 For each view we create a strongly-typed view with the appropriate scaffold template and create it as a partial view. If the IDinner type is not displayed in the “Model class” drop-down list, this may be because Visual Studio is not aware of the type yet - to fix this, you must save and compile the solution before trying to add views. If you get an error from Visual Studio when trying to add this view, please see this blog post for a possible solution. The Edit View uses the Edit template and also includes script library references. You may want to modify the reference to the jquery-1.7.1.min.js script from the generated template to point to the version of jQuery installed by the validation NuGet package (this is jquery-1.4.4.min.js at the time of writing). The Create View uses the Create template and again includes the script library references, which you should modify in the same way as you did for the Edit view. Adding strongly typed views in this way pre-populates the HTML with tables, forms and text where needed to display information and gather data from the user. However, we still have no way of registering attendees! To do that we need to add another action that will allow us to create an RSVP and attach it to a dinner. Like the Create, Edit and Delete actions, AddAttendee will be an action with two parts to it. The first part of the action, invoked by an HTTP GET (a normal link) will display a form in which the user can enter the email address they want to use for the RSVP. The second part of the action will handle the HTTP POST generated by that form when the user submits it - this part will use the details in the form to create a new RSVP entity and connect it to the correct event. The action will be created in the Home controller, so new methods will be added to HomeController.cs. Note the use of a hidden field in the form that carries the Dinner ID so that when we handle the POST we know which dinner to connect the response to. Here we do not use the MVC framework to data-bind the form values to an RSVP object because it will attempt to put the ID from the URL (which is the dinner ID) into the Id field of the RSVP, which is not what we want. Instead we just get the FormCollection to allow us to retrieve the form values. 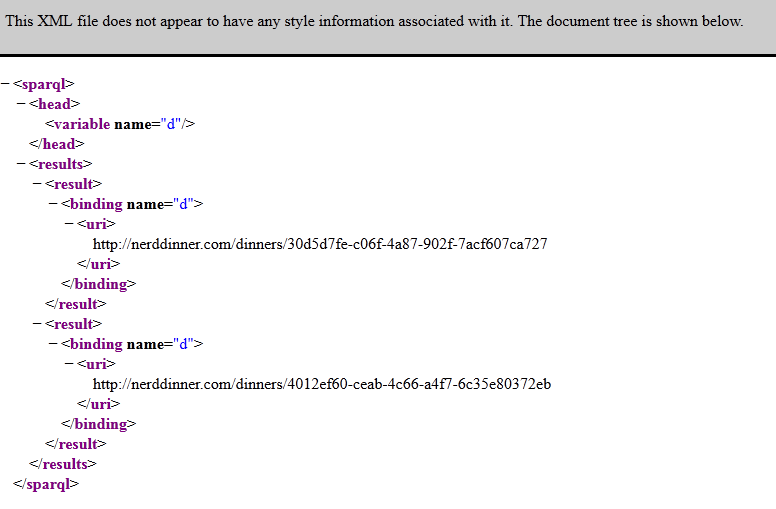 The code retrieves the DinnerId from the form and uses that to get the IDinner entity from BrightstarDB. 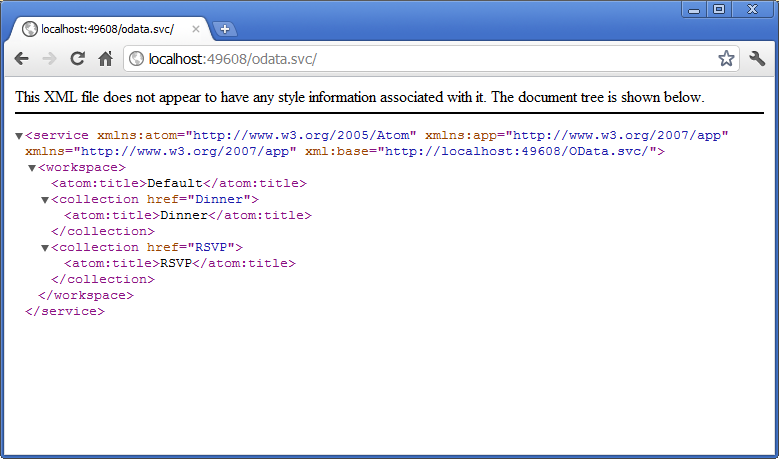 A new RSVP entity is then created using the AttendeeEmail value from the form and the dinner entity just found. The RSVP is then added to the BrightstarDB RSVPs collection and SaveChanges() is called to persist it. Finally the user is returned to the details page for the dinner. Change during development happens and many times, changes impact the persistent data model. Fortunately it is easy to modify the persistent data model with BrightstarDB. As an example we are going to add the requirement for dinners to have a specific City field (perhaps to allow grouping of dinners by the city the occur in for example). That is all that needs to be done from a BrightstarDB point of view! The City property is now assignable on all new and existing Dinner entities and you can write LINQ queries that make use of the City property. Of course, there are still a couple of things that need to change in our web interface. Open the Index, Create, Delete, Details and Edit views to add the new City property to the HTML so that you will be able to view and amend its data - the existing HTML in each of these views should provide you with the examples you need. If you use a query to find or group dinners by their city, those dinners that have no value for the city will not be returned by the query, and of course if you try to edit one of those dinners, then you will be required to provide a value for the City field. Custom Membership Providers are a quick and straightforward way of managing membership information when you wish to store that membership data in a data source that is not supported by the membership providers included within the .NET framework. Often developers will need to implement custom membership providers even when storing the data in a supported data source, because the schema of that membership information differs from that in the default providers. In this topic we are going to add a Custom Membership Provider to the Nerd Dinner sample so that users can register and login. Make the class extend System.Web.Security.MembershipProvider. This is the abstract class that all ASP.NET membership providers must inherit from. Right click on the MembershipProvider class name and choose “Implement abstract class” from the context menu, this automatically creates all the override methods that your custom class can implement. The Id property is decorated with the Identifier attribute to allow us to work with simpler string values rather than the full URI that is generated by BrightstarDB (for more information, please read the Entity Framework Documentation). To update the Brightstar Entity Context, right click on the NerdDinnerContext.tt file and select “Run Custom Tool” from the context menu. Note that if the name of your project is not BrightstarDB.Samples.NerdDinner, you will have to change the type="" attribute to the correct full type reference. a virtual directory not being configured as an application in IIS. The most likely problem is that you have added the <membership> and <authentication> tags into the Web.config file contained in the Views folder. These configuration elements must ONLY go in the Web.config file located in the project’s root directory. For the purpose of keeping this example simple, we will leave some of these methods to throw System.NotImplementedException, but you can add in whatever logic suits your business requirements once you have the basic functionality up and running. We add an Initialize() method along with a GetConfigValue() helper method to handle retrieving the configuration values from Web.config , and setting default values if it is unable to retrieve a value. We add three more helper methods: CreateSalt() and CreatePasswordHash() to help us with user passwords, and ConvertLoginToMembershipUser() to return a built in .NET MembershipUser object when given the BrightstarDB INerdDinnerLogin entity. 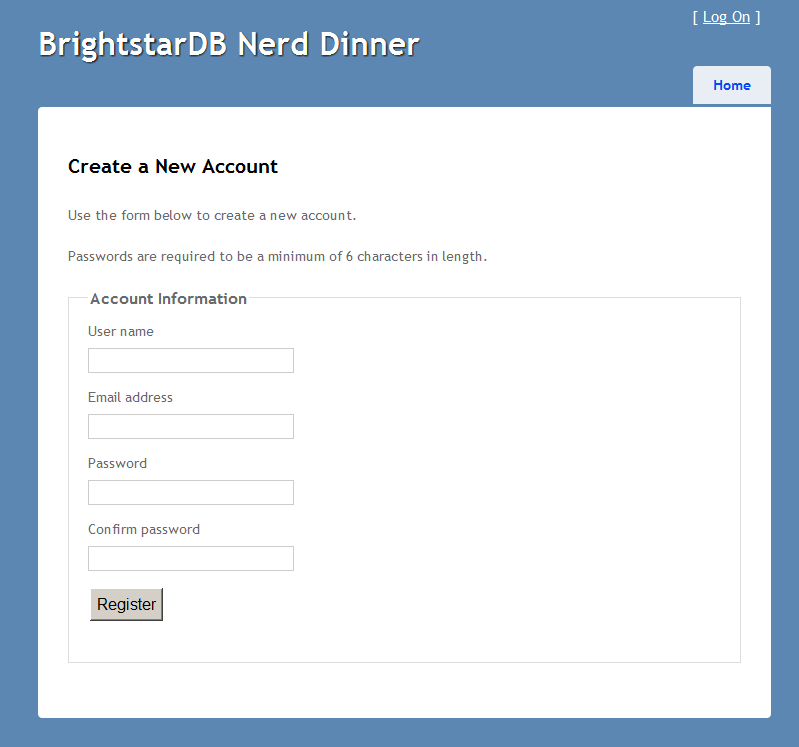 The CreateUser() method is used when a user registers on our site, the first part of this code validates based on the configuration settings (such as whether an email must be unique) and then creates a NerdDinnerLogin entity, adds it to the NerdDinnerContext and saves the changes to the BrightstarDB store. The GetUser() method simply looks up a login in the BrightstarDB store, and returns a .NET MembershipUser object with the help of the ConvertLoginToMembershipUser() method mentioned above. The GetUserNameByEmail() method is similar to the GetUser() method but looks up by email rather than username. It’s used by the CreateUser() method if the configuration settings specify that new users must have unique emails. The ValidateUser() method is used when a user logs in to our web application. The login is looked up in the BrightstarDB store by username, and then the password is checked. If the checks pass successfully then it returns a true value which enables the user to successfully login. An AccountController class with ActionResult methods for logging in, logging out and registering (in AccountController.cs in the Controllers folder). AccountModels.cs which contains classes for LogonModel and RegisterModel (in the Models folder). LogOn, Register, ChangePassword and ChangePasswordSuccess views that use the models to display form fields and validate input from the user (in the Views/Account folder). A _LogOnPartial view that is used in the main _Layout view to display a login link, or the username if the user is logged in (in the Views/Shared folder). The details of the contents of these files is beyond the scope of this tutorial, however the infrastructure is all designed to work with the configured Membership Provider for the web application - in our case the BrightstarMembershipProvider class we have just created. The AccountController created here has some dependencies on the Custom Role Provider discussed in the next section. You will need to complete the steps in the next section before you will be able to successfully register a user in the web application. In this tutorial we have walked through some simple steps to use a Custom Membership Provider to allow BrightstarDB to handle the authentication of users on your MVC3 Web Application. For simplicity, we have kept the same structure of membership information as we would find in a default provider, but you can expand on this sample to include extra membership information by simply adding more properties to the BrightstarDB entity. As with Custom Membership Providers, Custom Role Providers allow developers to use role management within application when either the role information is stored in a data source other than that supported by the default providers, or the role information is managed in a schema which differs from that set out in the default providers. In this topic we are going to add a Custom Role Provider to the Nerd Dinner sample so that we can restrict certain areas from users who are not members of the appropriate role. To update the context classes, right click on the NerdDinnerContext.tt file and select “Run Custom Tool” from the context menu. Right click on the RoleProvider class name and choose “Implement abstract class” from the context menu, this automatically creates all the override methods that your custom class can implement. We add an Initialize() method along with a GetConfigValue() helper method to handle retrieving the configuration values from Web.config, and setting default values if it is unable to retrieve a value. This method returns the contents of the Roles collection that we added to the INerdDinnerLogin entity as a string array. This method loops through the usernames and role names supplied, and looks up the logins from the BrightstarDB store. When found, the role names are added to the Roles collection for that login. This method loops through the usernames and role names supplied, and looks up the logins from the BrightstarDB store. When found, the role names are removed from the Roles collection for that login. The BrightstarDB store is searched for the login who matches the supplied username, and then a true or false is passed back depending on whether the role name was found in that login’s Role collection. If the login is inactive or locked out for any reason, then a false value is passed back. BrightstarDB is queried for all logins that contain the supplied role name in their Roles collection. /// in for the configured applicationName. ///   A string array of user names to be added to the specified roles. ///  A string array of the role names to add the specified user names to. ///  A string array of user names to be removed from the specified roles. ///  A string array of role names to remove the specified user names from. /// Gets a list of users in the specified role for the configured applicationName. /// specified role for the configured applicationName. /// role data source for the configured applicationName. /// Gets a list of all the roles for the configured applicationName. /// for the configured applicationName. /// user name to match. /// <paramref name="usernameToMatch"/> and the user is a member of the specified role. /// Gets or sets the name of the application to store and retrieve role information for. /// The name of the application to store and retrieve role information for. /// Adds a new role to the data source for the configured applicationName. /// Removes a role from the data source for the configured applicationName. /// true if the role was successfully deleted; otherwise, false. To display the functionality of the new Custom Role Provider, add 2 new ViewResult methods to the Home Controller. Notice that the [Authorize] MVC attribute has been added to each of the methods to restrict access to users in those roles only. Right click on the View() methods, and select “Add View” for each. 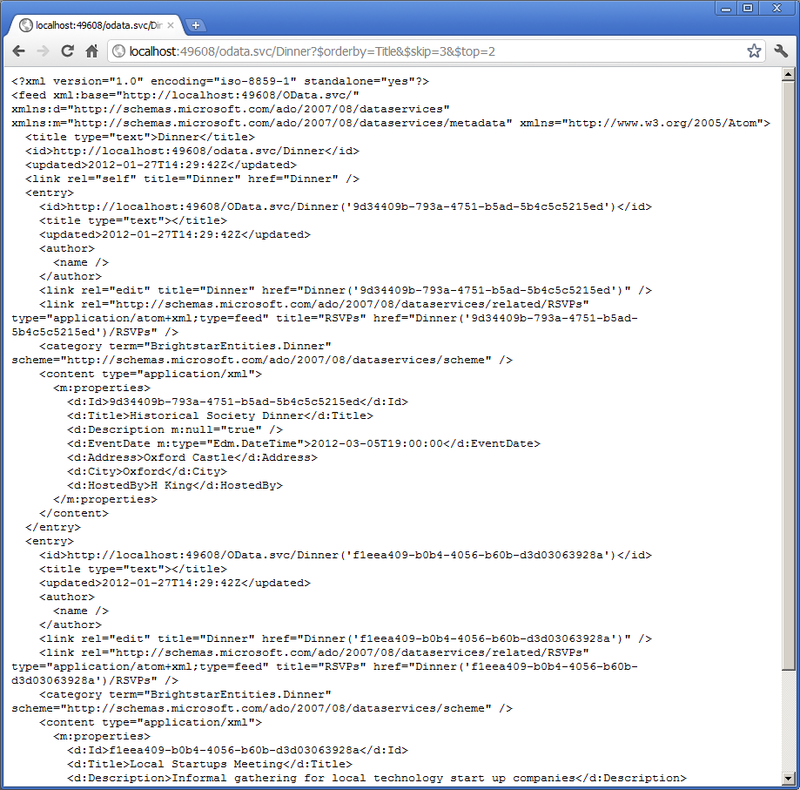 This automatically adds the SecureEditorSection.cshtml and SecureAdminSection.cshtml files to the Home view folder. In a real world application, you would manage roles within your own administration section, but for the purpose of this sample we are going with an overly simplistic way of adding a user to a role. Press F5 to run the application. You will notice a [Log On] link in the top right hand corner of the screen. You can navigate to the registration page via the logon page. Choosing a username, email and password will create a login entity for you in the BrightstarDB store, and automatically log you in. The partial view that contains the login link code recognizes that you are logged in and displays your username and a [Log Off] link. Clicking the links clears the cookies that keep you logged in to the website. You can log on again at any time by entering your username and password. Clicking on the navigation links to “Secure Editor Section” will allow access to that view. Whereas the “Secure Admin Section” will not pass authorization - by default MVC redirects the user to the login view. As data on the web becomes more predominant, it is becoming increasingly important to be able to expose the underlying data of a web application in some way that is easy for external applications to consume. While many web applications choose to expose bespoke APIs, these are difficult for developers to use because each API has its own data structures and calls to access data. However there are two well supported standards for publishing data on the web - OData and SPARQL. OData is an open standard, originally created by Microsoft, that provides a framework for exposing a collection of entities as data accessible by URIs and represented in ATOM feeds. SPARQL is a standard from the W3C for querying an RDF data store. Because BrightstarDB is, under the hood, an RDF data store adding SPARQL support is pretty straightforward; and because the BrightstarDB Entity Framework provides a set of entity classes, it is also very easy to create an OData endpoint. In this section we will show how to add these different forms of Linked Data to your web application. The standard way of interfacing to a SPARQL endpoint is to either use an HTTP GET with a ?query= parameter that carries the SPARQL query as a string; or to use an HTTP POST which has a form encoded in the POST request with a query field in it. For this example we will do the latter as it is easiest to show and test with a browser-based API. We will create a query action at /sparql, and include a form that allows a SPARQL query to be submitted through the browser. To do this we need to create a new Controller to handle the /sparql URL. Right-click on the Controllers folder and choose Add > Controller. In the dialog that is displayed, change the controller name to SparqlController, and choose the Empty MVC Controller template option from the drop-down list. The first method just displays a form that will allow a user to enter a SPARQL query. The second method handles a POST operation and extracts the SPARQL query and executes it, returning the results to the browser directly as an XML data stream. Now you can compile and run the web application again and click on the Query SPARQL link at the top of the page (or simply navigate to the /sparql address for the web application). As this is a normal browser HTTP GET, you will see the form rendered by the first of the two action methods. 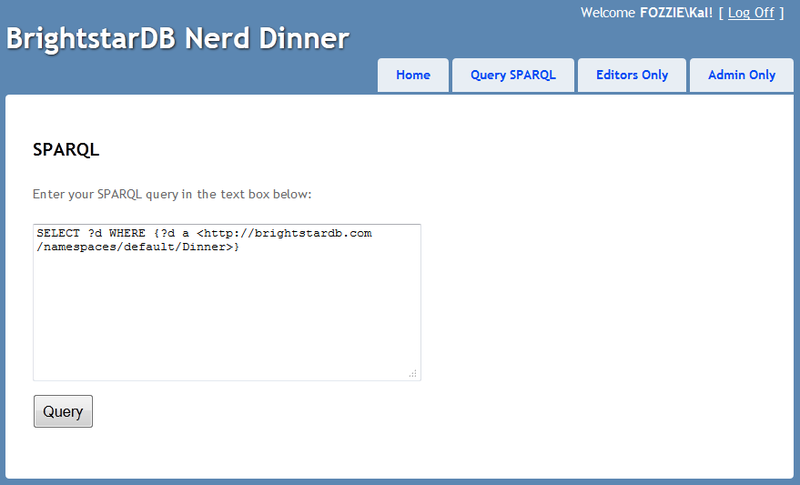 By default this contains a SPARQL query that should work nicely against the NerdDinner entity model, returning the URI identifiers of all Dinner entities in the BrightstarDB data store. Clicking on the Query button submits the form, simulating an HTTP POST from an external application. The results are returned as raw XML, which will be formatted and displayed depending on which browser you use and your browser settings (the screenshot below is from a Firefox browser window). The Open Data Protocol (OData) is an open web protocol for querying and updating data. An OData provider can be added to BrightstarDB Entity Framework projects to allow OData consumers to query the underlying data. The following steps describe how to create an OData provider to an existing project (in this example we add to the NerdDinner MVC Web Application project). Right-click on the project in the Solution Explorer and select Add New Item. In the dialog that is displayed click on Web, and select WCF Data Service. Rename this to OData.svc and click Add. Change the class inheritance from DataService to EntityDataService, and add the name of the BrightstarEntityContext to the type argument. The OData service can now be queried using the standard OData conventions. There are a few restrictions when using OData services with BrighstarDB. The data in BrighstarDB can be consumed by various OData consumers. 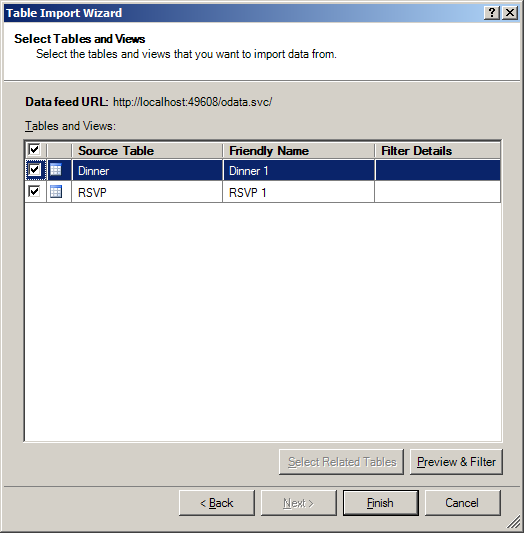 In this topic we look at consuming the data using PowerPivot (a list of recommended OData consumers can be found odata.org/consumers). Add a name for your feed, and enter the URL of the OData service file for your BrightstarDB application. 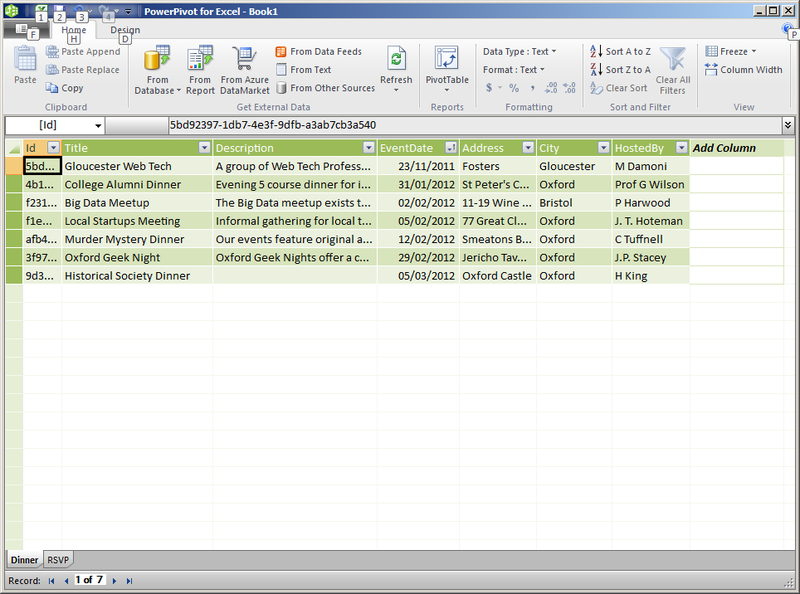 This then shows all the data that is consumed from the OData service in the PowerPivot window. When any data is added or edited in the BrightstarDB store, the data in the PowerPivot windows can be updated by clicking the Refresh button. One of the things that makes BrightstarDB unique is the ability to map multiple object models onto the same data and to map an object model onto existing RDF data. An example of this could be when some contact data in the RDF FOAF vocabulary is imported into BrightstarDB and an application wants to make use of that data. Using the BrightstarDB annotations it is possible to map object classes and properties to existing types and property types. <http://www.brightstardb.com/people/david> <http://xmlns.com/foaf/0.1/name> "David Summers" . <http://www.brightstardb.com/people/simon> <http://xmlns.com/foaf/0.1/name> "Simon Williamson" . To access this data from the Entity Framework, we need to define the mappings between the RDF predictates and the properties on an object that represents an entity in the store. The properties are marked up with the PropertyType attribute of the RDF predicate. If the property “Name” should match the predicate http://xmlns.com/foaf/0.1/name, we add the attribute [PropertyType("http://xmlns.com/foaf/0.1/name")]. 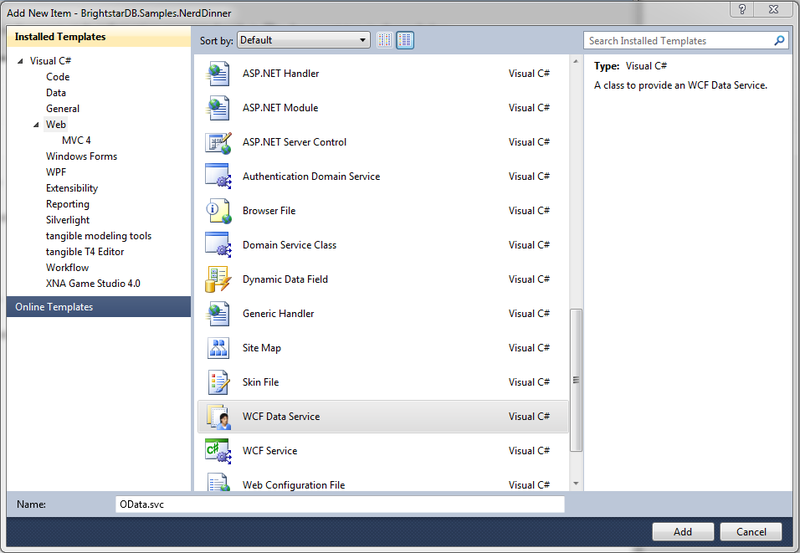 Once there is RDF data in the store, and an interface that maps an entity to the RDF data, the data can then be accessed easy using the Entity Framework by using the correct connection string to directly access the store. The code below connects to the store to access all the people in the RDF data, it then writes their name and place of employment, along with all the people they know or are known by. 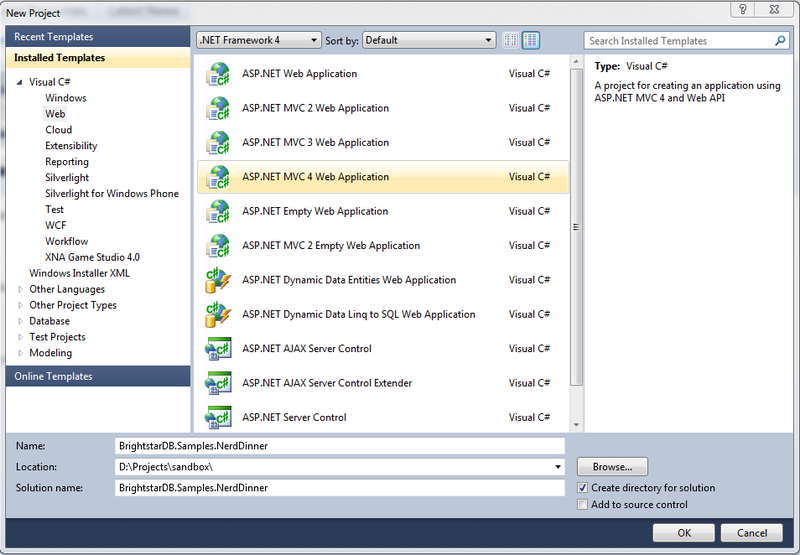 Creating the ASP.NET MVC4 Application. The following FOAF RDF triples are added to the data store.